Find Better Ideas, Faster ® with a custom treehouse trend report, our PRO Dashboard and 80+ categories of premium trend reports. 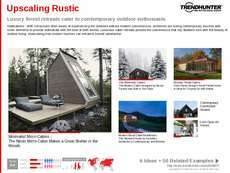 The Treehouse Trend Report covers every aspect of treehouse design. Not just for children anymore, treehouses have expanded into other realms including adult-orientated getaways, sustainable architectural designs and even leafy, tree-themed hotel hot spots. 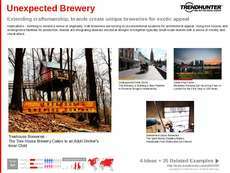 Our research explores the newest developments and designs concerning treehouse construction, and also covers some of the newest applications and functional possibilities that present themselves. Architects, designers, hotel owners, entrepreneurs and curious homeowners can gain valuable insight into the world of treehouses with our collection of curated trends and crowd-sourced data. Anyone looking to expand their client base to include more eco-minded consumers will find the report to be a useful tool. 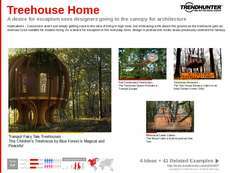 The Treehouse Trend Report is a helpful resource for gaining valuable knowledge on the newest innovations and designs regarding contemporary treehouses.